The Simple Catalyst is an Alchemy reagent from Blood Magic. 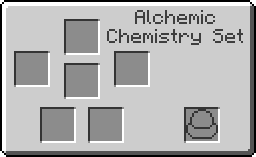 They are used in almost every alchemy recipes as well as the crafting of various spell components. Weak Blood Orb can be substituted with the following items: Apprentice Blood Orb, Magician's Blood Orb, Master Blood Orb, Archmage's Blood Orb, Transcendent Blood Orb, Eldritch Blood Orb. This page was last modified on 14 December 2018, at 20:10.